Meet the LatticeAx™ Product Line – an accurate, fast, low-cost cleaving solution, suitable for any lab. 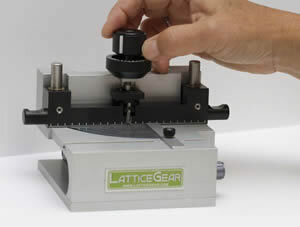 The LatticeAx™ is a precision cleaver that fits in the palm of your hand. In an amazingly small footprint (4" cube, 100mm³), the patent-pending "Ax" and process are designed to assist the user to cleave site specific targets, as well as wafers, strips, or pieces to precisely sized samples with localized targets. One of the smallest, most efficient silicon wafer cleaving tools in the world, the LatticeAx™ is sure to revolutionize your workflow. The LatticeAx™ features and process optimizes the very basic elements of the manual cleaving technique and overcomes manual cleaving disadvantages, such as lack of accuracy and repeatability. This machine-assisted hybrid cleaving tool bridges the gap between manual scribing and fully automated cleaving. It increases success rate by any user while keeping costs down. It takes little training and users will be "cleaving in minutes and experts in a day." This machine-assisted hybrid cleaving tool bridges the gap between manual scribing and fully automated cleaving. It also increases success rate by any user while keeping costs down. 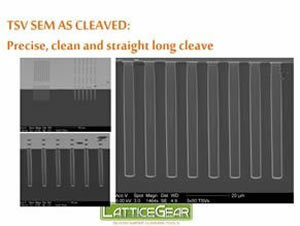 Cleaving with the LatticeAx™ 225 and 420 products deliver 20 and 10µm targeting accuracy respectively. Cleaving is fast (<5 minutes), clean and repeatable. While a manual scribe and cleave is fast (about 2 minutes), it is not repeatable or accurate. Accuracy can be improved when the manual scribe is made while viewing the sample with a stereoscope (50-100µm). In both cases, targeting accuracy and quality varies by user. In the past decade, automated micro-cleaving tools improved targeting accuracy and sample quality needed for high resolution SEM imaging. These improvements came with strict pre-preparation requirements, lower throughput, inability to handle small and thin samples, and much higher cost than manual cleaving. The LatticeAx™ features and process optimizes the very basic elements of the manual cleaving technique and overcomes manual cleaving disadvantages, such as lack of accuracy and repeatability. Using the LatticeAx™, wafer cleaving is accomplished in three basicsteps that compliment existing skill sets used in wafer analysis. Select target under high magnification (up to 80x) and use micrometer to position the indenter tip. A precision control knob coupled with a sharp indenter tip results in fine indentation at the edge of the sample. Cleaving position consists of a set cleaving pin and a cleaving bar used to apply uniform pressure to achieve a controlled cleave. Cleave is always clean and precise. Every user can cleave samples with wide variation of size, thickness and materials at high quality within 2 minutes. By using the Patent Pending LatticeAx™ base platform, every user can cleave samples with wide variation in size, thickness and materials at high quality within 2 minutes. It uses precision knobs to produce fine, reproducible surface indentation followed by slow, controlled cleaving. The indenter is controlled by a stage with 5µm steps. Combine this tool with your own optical microscope to improve cleaving accuracy. Determined by the scope and software you provide. Combine this tool with your own optical microscope to improve cleaving accuracy. The addition of high magnification imaging enables accurate indenting, resulting in samples cleaved with high accuracy. 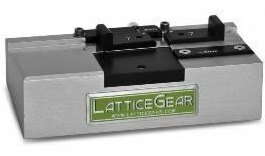 The LatticeAx™ 225 delivers 20µm accuracy with high quality cleaved surfaces in 5 min. 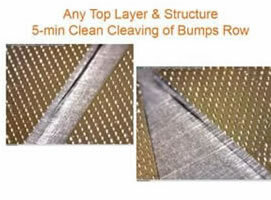 It integrates the patent pending LatticeAx™ base with an industrial platform customized for indenting and cleaving. The imaging package includes a focusing mount, a digital microscope with polarizer and real-time image acquisition and display software. With realtime imaging the indent is placed accurately with respect to the target making cleaving sample target simple and fast for all users. The 225 accepts samples with a wide range of sizes, thicknesses and materials. The LatticeAx™ 225 combined with the Large Sample Platform for LatticeAx™ (EMS Cat #7653) is commonly used to downsize wafers up to 300 mm. 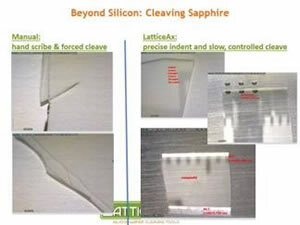 It can indent and cleave cleanly, not generating excessive silicon dust and resulting in clean edges. Because of the accuracy of the indent die can be excised without loss of material. LatticeAx™ 420 is Electron Microscopy Sciences' highest performance cleaving solution. It integrates a custom designed, stable, small footprint workstation and vision package with 4µm optical resolution and precise focus control to cleave with 10µm accuracy in <5 minutes. It delivers a cleaving accuracy of 10µm in <5 minutes. The patent pending LatticeAx™ base is integrated with a complete vision package that includes a monocular microscope with 4µm optical resolution, color CCD camera and real-time image acquisition and display software, as well as, X-Y stage. 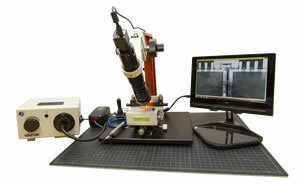 This dedicated cleaving workstation is used to survey, align, micro-indent, cleave, and inspect any sample by any user. A Navitar Zoom 12X monocular microscope with continuous zoom (.58-7X) and fine focus coupled with an ultra-compact UXGA 1600x1200 pixel color USB CCD camera with image display software*. The package also integrates a robust, coarse and fine focusing mount and fiber optic ring lighting. 110 or 220. Price varies, so please specify when requesting a quote. Flat stage with vacuum to hold the sample in place during indentation. Using the indenter knob, create a pristine, controlled surface indentation: L-1mm (from leading edge), W- 10um, D- shallow / user selection. Using the cleaving bar and turning knob, cleave slowly and controllably perpendicular to the primary sample axis, from the indentation. 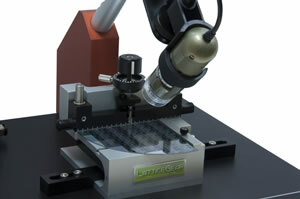 The Large Sample and Whole Wafer Cleaving Accessory (LSPL) supports samples up to 300 mm during indenting and cleaving. The LSPL fits on all LatticeAx™ models. This accessory easily attaches to the LatticeAx™ with a single set-screw. The sample is supported by four delron arms that do not damage the backside of the wafer. The indenter position extender knob allows the user to access to the LatticeAx positioning knob even with a large sample mounted so fine positioning of the diamond indenter is possible. Custom diamond indenter for the LatticeAx™. The LatticeAx™ indenter is easily replaced by the user and comes with screws, allen wrench and installation instructions. Polished end for improved positioning. Cleaving Kit: The complete tool set to get from wafer to cleanly cleaved pieces. This is a critical step to getting the best crosssections. The kit includes wafer mat, scribes for marking and scribing, pliers for cleaving, rulers and instructions. Large Cutting Mat: Wafer-cutting mat, self healing, double sided, green and black, 18" x 24"
Small Ruler Mat: Self healing, Small wafer piece ruler mat, double sided, green and black, 3½" x 5½"